The 2009 Maryland Horse Forum on August 6 will provide the equestrian community with a unique opportunity to share ideas and visions for the future of Maryland’s horse industry. Although The Equiery primarily serves the non-racing horse interests in Maryland (the sport and pleasure segment accounts for 50% of the horse industry’s annual $1.5 billion dollar economic impact – stats pre recession), there is no question that the racing industry has a ripple effect upon the non-racing segment. The past twelve months have held high drama for the racing industry, from the slots vote to slots applications, from lawsuits to counter lawsuits, from track bankruptcies to track sales, the past twelve months have held high drama which affects all of us in the horse industry. The Horse Forum will provide the leaders of racing as well as the participants in racing an opportunity to share concerns and ideas. To begin the discussion, The Equiery offers the thoughts of two long time pundits of Maryland racing. Tim Capps, currently the “Executive-in-Residence” at the College of Business, Equine Program, University of Louisville, is the former publisher of Mid-Atlantic Thoroughbred, former executive director of the Maryland Horse Breeders Association, and a former vice president of the Maryland Jockey Club, which owns Laurel Park and Pimlico Race Track (MJC is, in turn, owned by Magna Entertainment Corporation). Ross Peddicord, currently publisher of Maryland Life, was the Baltimore Sun’s award winning race writer for almost twenty years, and was a frequent contributor to the Maryland Horse (now Mid-Atlantic Thoroughbred). Maryland’s horse racing heritage is second to that of few states, and has spawned a legacy of horse activities that remain vital today despite urban/suburban sprawl, cultural and social changes, and economic pressures that tend to compromise rural and agricultural lifestyles. A notable symbol of that is the Maryland-Bred Fund, an incentive program devised by the state’s Thoroughbred breeders, led by the estimable Hal Clagett, and created by act of the legislature in 1962. The idea was to set aside a slice of the pari-mutuel handle, just over 1%, and allocate it into a fund that would reward people for owning and breeding Maryland-foaled Thoroughbreds. While it was a controversial idea at the time, few people would argue that the Fund, the first of its type in American Thoroughbred racing, has been a success story for the local industry since its establishment. In fact, the Maryland Fund became such an object of admiration that it has been duplicated in 27 other states since–and it is that duplication that has become a problem for Maryland racing and now represents yet another threat to both the primacy of Maryland as a racing and breeding state in the mid-Atlantic region and to the long-term survivability of Maryland racing. Breeders’ incentive funds, which are essentially purse funds distributed in several different ways, are funded, as noted above, from pari-mutuel handle. That is the first problem for the Maryland Fund, and its Standardbred counterpart, which have been in slow but steady decline as wagering handle in Maryland has been eroding through much of this decade, including wagering on Maryland races in out-of-state markets via simulcasting. This problem has been exacerbated by reductions in live racing in the state, notably the shutdown of Rosecroft Raceway in Oxon Hill last year for live harness racing. Although the amount handle on Rosecroft’s nighttime signal was modest, the existence of live racing was another reason for customers to go to the track, even though they might bet more on other races than the local product. Simulcast-only days (and nights) still generate revenues, but in lower volume than on live days, by as much as 40%. Thus, the Maryland-Bred Fund, which has been distributing between $4 million and $4.6 million since the 1990s, has barely held its own in the $4 million range while watching the unthinkable happen in nearby states as breeders’ funds and purses have swelled to unimaginable levels due to the flood of monies from slot machines at the region’s race tracks. • Pennsylvania, whose fund had already approximately doubled the Maryland Fund early in the decade, saw its distributions increase to more than $21 million in 2008, with more to come in 2009, despite the nasty recession and its impact on all businesses, including the state’s slot sites. • New York, whose pari-mutuel business is by far the largest east of California, already was giving away $30 million or more in breeders’ funds annually, before slots money started flowing into the coffers from slots at upstate tracks, and stands to eventually grow tremendously once slots are placed at Aqueduct and possibly Belmont Park in the New York City area. It would have been almost impossible to imagine this scenario only a few years ago: Maryland, long home to the best breeding and racing in the region, envied for its productive horse farms and solid base of competition, fading slowly away as places that were never known for the quality of their horses or their racing, lacking the history and heritage of Maryland racing or its big events, such as the Preakness, Pimlico Special, or Maryland Million, days that gave Maryland a national presence and lent further credibility to its place as the signature of racing and breeding in the region. While devisiveness and shortsightedness within the local industry has played some part in the current malaise, there is no question that Maryland’s lateness to the slot machine table and the narrowly crafted slots law that finally emerged as law last year has put the state’s racing interests at a terrible disadvantage versus their regional counterparts. Maryland is not only playing catch-up, it is no longer clear that, even when slots revenues start to flow, the local industry will benefit as much as it once would have or could have, nor that having fallen in arrears of Pennsylvania and New York, the state will ever again occupy the high ground in the regional breeding market that it held for literally more than two centuries. While Maryland could be a very lucrative gambling state, it will not come close to reaching its potential with the limitations placed on slot locations by lawmakers and the revenue distributions that will discourage would-be operators from investing in competitive facilities. The gambling laws in surrounding states are far more favorable toward the investor-operators than is Maryland’s statute, and it is no accident that when the window was opened for applications in the five jurisdictions where slots facilities could be built, the response was tepid. Will there be a legislative initiative to change these conditions? None is apparently being talked about at the moment, with lawmakers likely weary of the bruises and cuts of legislative battles over the slots issue that ultimately led to the poorly designed compromise now on the books, even though what is there will not come close to meeting the state’s own revenue objectives, much less those of the racing industry. If an incentive fund’s primary purpose is to stimulate the marketability of the locally bred horse, then the Maryland Fund’s structure should do so, with its focus on owner awards for success in non-restricted races (those not exclusively for Maryland-breds) and incentives for owners and stallion operators. The other states mentioned, and most others around the country, give away lots of money to horses competing in state-bred races, which is a happy occurrence for people who own those horses, but has proven to be more of an incentive to simply breed MORE horses, not better ones. All things being equal, then, the Maryland Fund would do more to improve marketability than its regional counterparts, even as the other nearby incentive programs surpassed it in monetary value. 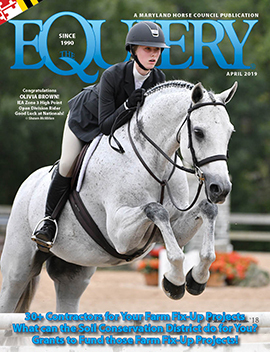 However, the disparity in funding has finally caught up with the Maryland breeding industry, and more and more breeders are now sending mares to Pennsylvania to foal, thinking that the resulting offspring’s value at sales will be materially improved because it carries the line “Registered Pennsylvania-bred” on a sales catalogue page. Money certainly talks loudest at the end of the day, and the fact that it doesn’t take much horse to win that Penn-bred money is of little consequence to the person who is paying the training bills. Maryland still has its racing history and heritage intact, and many knowledgeable and motivated breeders, owners and trainers in its ranks. Maryland horsemanship is unsurpassed in the region and beyond, but as its racing program continues to winnow away and its breeding production slide, there has to be a sense of discouragement and melancholy in its racing community. One can only hope that the mess surrounding the Anne Arundel County slots license can be dealt with in a timely manner (meaning before the onset of the next decade) and that slots licenses get awarded accordingly. The Magna bankruptcy, of course, could not have occurred at a much worse time for Maryland racing, and its uncertain conclusion and the future ownership of Laurel and Pimlico is another cloud over the future of horse racing in the state. The Maryland Fund, and much else that ails Maryland horse racing, needs, more than anything, a massive influx of money, the type of money that today can only come from expanded gambling, and it is not evident that this can happen under the current statutory model for gambling in Maryland. Maryland needs a new slots law before the one it has ends up in the dustbin of bad legislative history, an idea that gained nothing for anyone. The unthinkable has happened, and it is beyond the thinking stage. Fresh, innovative and bold thinking is hard to come by right now. Where’s the next Frank De Francis when you need him? Wasn’t it Mark Twain who said “The reports of my death are greatly exaggerated”? It’s high time we stopped talking about the death of the Maryland horse racing and breeding industry, and started planning for its renaissance. Hopefully that is going to be among “A-list” topics when horsemen and officials from across the state meet August 6 at the Maryland Horse Forum at the Prince Georges Equestrian Center. Pundits, and even people in our own industry, have been flogging this (pardon the expression) dead horse for so long, that the demise of the industry has seemed imminent. For one thing, unlike Delaware and West Virginia in the 1980s and early 1990s, we haven’t gone so far as to actually close down our tracks for several years. People seem to forget that’s exactly what happened in those states now that they are awash in slots cash. Those states really did have racing industries that totally died and then came back stronger than ever. That has not happened here, although we have been down-at-heel the last few years. Things were so bad at Charles Town that owners and trainers were actually giving away young, sound horses for free. I know; I got one! Now every time Pennsylvania builds a new slots parlor or adds another purse or breeders’ award incentive, the reaction from many Marylanders seems to be to recoil in fear, to ask why we can’t get more of a government handout (in the form of yet-to-be-realized slots revenues), and to make plans to cut and run. There is no doubt that the public perception, propagated by many of our own stakeholders and by some turns of events, is that Maryland horse racing is a dying industry. If the sport is going to rebound, it is going to take (in addition to an infusion of slots cash) an energized marketing campaign by all stakeholders (not just the tracks), some exciting new business initiatives and a good dose of chutzpah to turn it around. Now, with Ocean Downs and Cecil County moving forward, we are starting to see glimmers of hope that some of the tools to do just that are going to be implemented! Meanwhile, the preliminary site plan for the proposed Hollywood Casino in Cecil County (off the I-95 and RT 22 interchange) passed the Perryville Town Council unanimously in July. The Havre de Grace Record reported that slots operator Penn National Gaming could start breaking ground for Phase 1A of its project this month. Momentum from these two projects could spur officials and would-be operators at the Baltimore City and Anne Arundel County sites to jump on the slots bandwagon and expedite approvals and plans. Bottom line: During 2010, a year earlier than anticipated, the racing and breeding industries could start to see some sorely-needed revenues accumulating to help build back up their purse and breeders’ awards funds. Getting an extra injection of cash is fine, but now is also the time to seize the moment, when things start to turn around, and make sure it snowballs into added long-term growth and prosperity. Like BRAC-related [the Base Realignment and Closure project] jobs and residents moving here from New Jersey, the slots money will be coming in increments, a small amount at first, then building up as more and more parlors and machines come on board. So that gives time to plan and implement re-built marketing and business strategies for the tracks and their affiliated stakeholders. It is an ideal time to re-think old business and marketing models, create new and exciting initiatives that will draw 21st-century-era fans to the track, build cooperation among industry stakeholders, stop re-living old baggage from the past and plan for a new era of success. If every time Nike came out with a new shoe, Kevin Plank and his athletic apparel company, Under Armour, ran and hid, looked for a government handout, and told everyone he met that his company was going under, that’s exactly what would happen. Instead, he uses his creative team to build better products, he looks globally for opportunities and new ideas, and he forms new partnerships, and markets, markets, markets! Maryland racing can’t afford to buy many Super Bowl commercials (like Under Armour did to promote its new shoe), but it sure can think creatively and try new ideas to get more customers out to the track, attract more owners of racehorses and to take good care of its current ones. It is not just the tracks’ responsibility, but also all stakeholders who can develop new partnerships, join chambers of commerce, increase their visibility and activity with state tourism and economic development departments, participate in business roundtables and become involved partners in all sorts of creative ways throughout the state. 1. Maryland has a stronger state economy. Pennsylvania currently has 8.2 percent unemployment, a percentage higher than Maryland, and 22 of the PA counties are above the national 9.5 percent unemployment rate. 2. The wealthy Balto-Washington metropolitan area that rivals the Philadelphia-South Jersey area and has a steadier income base due to the number of federal government jobs and associated agencies and businesses. 3. Maryland has a new incoming population already familiar with racing: the infusion of new jobs and residents into Maryland from the BRAC program (many will be relocating from Fort Monmouth, N.J., a stone’s throw from Monmouth Park). 4. The Preakness trumps any and every race in surrounding states. No matter what you say about Magna (the company that owns Laurel and Pimlico), they have installed first-rate dirt and turf courses at Laurel and they do a heck of a job in promoting the Preakness. The Pennsylvania Derby certainly does not rival the Preakness. 5. Maryland has an educated and experienced racetrack and industry workforce. We have the tradition and expertise of world-class racing personnel–not only the people that do the everyday grunt work of running the tracks and taking care of the horses, but Marylanders have been perfecting horse owning, training and breeding for centuries. That kind of professionalism and expertise is not born overnight, no matter how much money is being thrown around. If Laurel Park can’t be an entertainment success located smack dab in the middle of 6 million people and one of the most affluent economies of the world, then it’s time to make some major changes, try new initiatives and think creatively. How about free admission and parking for starters? How about racing festivals every weekend? Our magazine, Maryland Life, works closely with Garrett County Tourism, and every weekend they have some kind of unique event or festival going on. Population and income-wise, Garrett County is one of Maryland’s smallest and least affluent counties, but increasingly Deep Creek Lake has become a tourism oasis, rivaling other well-known and well-funded tourism destinations. Churchill Downs management just experimented with installing temporary lights and offered “Downs After Dark,” recording encouraging attendance figures, especially among new and younger consumers. Why is Maryland’s antiquated model, where only harness racing is offered at night, still in existence? It’s costing the taxpayers millions of potential revenue. Who the heck can go to the races during the day? Most people are working! Who is the genius who thought up that business model? Did he say: Why don’t we operate when most of our potential customers are at work? Maybe it worked in the 1950s when racing was the only gambling product in town, but it sure doesn’t work anymore. John McDaniel, current racing commissioner and former chair, formed a “Keep It in Maryland” (KIM) group a couple of years ago to study ways to promote Maryland racing and breeding. He and the Maryland Racing Commission members are key players to step up leadership roles. McDaniel and a group of interested owner/breeders met with administrators and faculty at Loyola College this summer and an MBA management class this fall will be starting to work on a Masters-level project to map out a strategic plan for the future of the state’s racing industry. When the track ownership issue is settled, how about establishing marketing liaisons between the tracks owners and affiliated stakeholders? If people start to see positive activity taking place, they will respond positively. Guess what? All is not entirely well in the halls of Harrisburg, the legislative capitol of our perceived greatest threat: the emerging slots goliath in Pennsylvania. There is legislation proposed there to take back $100 million of the slots money allocated to horsemen and tracks and use that money to help balance a multi-billion dollar state deficit. So he who giveth, can taketh away. Dynamics are constantly changing. It’s time to stop the nay-saying and move forward. With all the talented people that there are in the Maryland horse industry, there is absolutely no reason why its racing and breeding industry cannot flourish.